ATLANTA, Ga. — A powered auxiliary axle for road tractors from Hyliion, a recent start-up company, won the 2018 Jim Winsor Memorial Technical Achievement Award, the awards committee has announced. 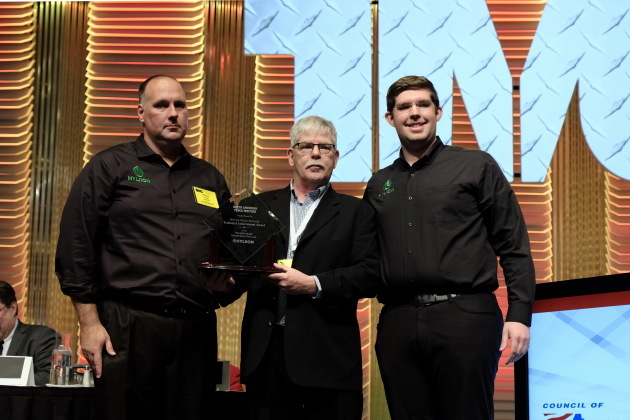 Called 6x4HE, the fuel-saving electric drive-axle system was selected from five finalists by a panel of truck writers, and presented Wednesday, March 7, during the Technology & Maintenance Council’s annual meeting in Atlanta, Ga. The electric axle, when added to a truck or tractor, acts as a hybrid system, capturing braking energy and converting it to electricity, then uses that energy to help launch the vehicle and propel it up hills, explained Thomas Healy, founder and CEO of Hyliion. This relieves the engine of some of its usual work and thus saves fuel. It also reduces wear on service brakes. The 6x4HE, consisting of an axle, a motor-generator, a lithium-ion battery pack and electronic controls, can replace the second axle in a “live” tandem or be added to a 6×2 tandem to effectively turn the truck into a 6×4. Through advanced GPS and terrain maps, the system’s controllers can determine power or recharge settings to minimize fuel consumption or maximize charging opportunities while driving. Another Hyliion hybrid-electric axle product is made for trailers. The award finalists were chosen by a group of 12 trade press editors, whose group was formerly the Truck Writers of North America’s Technical Achievement Award committee. TWNA was officially disbanded in 2017, but its directors provided funding so the Technical Achievement Award can continue indefinitely. The writers renamed the award to honor Jim Winsor, whose journalism career spanned more than 50 years in service to the trucking industry. He worked his way through college by driving cargo trucks, and then served in the U.S. Army as a Transportation Corps lieutenant. He was active with the Truck Maintenance Committee, forerunner to today’s TMC — both arms of the American Trucking Associations. Winsor served on TMC’s board of directors and several working groups, and contributed to many recommended practices for effective maintenance. He organized and moderated numerous technical sessions for TMC meetings. Winsor was honored with TWNA’s Lifetime Achievement Award and TMC’s highest honor, the Silver Spark Plug. From left to right: Chris Langley, VP of Fleet Relations, Hyliion; Jim Park, award committee chair; and Thomas Healy, founder and CEO, Hyliion.